At our site www.unity153.net you may purchase the books published by Servias Ministries. The price represents a contribution less the cost of publication. We provide a contribution letters with the net value of the contribution. Tell us how many copies of each book you would like. The minimum price per book is $0.00. That is what I would call the ultimate “Black Friday Special”. At our site www.unity153.net you may purchase the books published by Servias Ministries. The price represents a contribution less the cost of publication. We provide a contribution letters with the net value of the contribution. In the past, we have offered these books at no charge to those who could not afford the price listed. We simply asked them to write us. We have now changed the website for those who sign up as “members”. Members can ask for a complimentary copy of any combination of books at no charge. Clearly those who can afford to contribute should be encouraged to pay the suggested price. However, we do not want to restrict anyone from being blessed by these writers. If you sign in to Your Information, we have added this option for your complimentary copy(s). We will send them to the address in your profile. As we do with all complimentary copies, we will pay the shipping/mailing costs. If you are overseas, be sure to double check the address info, we know international mailing can be a challenge. We appreciate our donors whose contributions allow us to expand the ministry to those who are finding difficult to make ends meet… most all of us have been there! I will be on a “special” mission for 11 days beginning on the 11th and will have limited access to the Internet. I don’t expect to write any blogs during that period unless Our Heavenly Father decides something different. For those who haven’t yet watched our online broadcasts of “Raising a Remnant”, I encourage you to do so. We archive them so you are not required to watch them live. Go to http://www.ustream.tv/channel/the-baptism-of-love It is best to watch them in order. If you get a single, fresh revelation in 75 minutes of viewing, isn’t it worth it? You don’t even have to travel a thousand miles to get it. What a deal! We will not have our weekly Bible study on the 12th or 19th, but will resume on the 26th. Our Heavenly Father uses various means to express HIS Heart and Character. The Holy Scripture is one means, these blogs are another means, and writings by those who have studied and meditated on HIS Word are another great source. Over the years I have read countless books and listened to many recordings, some as many as six to seven times. Why so many? Because the concentration of revelation and understanding contained necessitated multiple exposures. It’s is one aspect of immersing yourself in revelation. 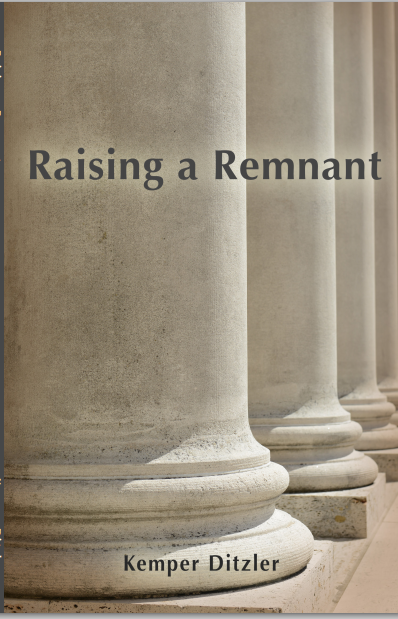 Raising a Remnant is another such book. While at the beach, I like to read and contemplate the deeper truths. The peace and tranquility of the waves provide an excellent backdrop for a revelation to “soak in”. We will mail you a book at no cost. The biggest issue I have with this book is that if I underline everything I want to go back and review, each page begins to take on a yellow hue! Do you get my drift? Isaiah 1:9 states, “Except the Lord of hosts had left unto us a very small remnant, we should have been as Sodom, and we should have been like unto Gomorrah.” Throughout the ages the Lord has reserved a people unto Himself (Romans11:4,5) who resemble a stream of living water winding its way through the wilderness until it assembles as a pool in the end, becoming a lake surrounded by the arid earth. These people believing God’s promises, carry within themselves from one generation to the next the love of the truth of the Kingdom of God. Hebrews chapter eleven provides us testimony of some of these believers. This Remnant preserves mankind unto the coming Day of the Lord Jesus Christ. After the cares of this world, the deceitfulness of riches and the lusts of other things have claimed their toll on the majority of men, those who remain are those who adhere to the promises of God. This Remnant in the end shall be raised up as His standard. In that time, that which has been unseen shall be seen, for it will be revealed through the Remnant. You may purchase this book at: www.unity153.net and click on “Books” button. We will gladly send you the book at our expense. Now is the time to prepare yourself for what lies ahead. As for me, I have read it once and will read and study it again. The truths in it are important for us to have written on our hearts and foreheads. As always, if you do not have the funds to purchase the book we will send you a free copy and pay the shipping & handling as well. Why? Because we Love you and we don’t want you to miss out on the Spiritual Truths contained in this book! I am pleased to announce the latest book published by Servias Ministries is now available for ordering at the www.unity153.net website. I have read the manuscript and believe that the book should be read by every person who wants to move to a higher level of maturity in the Body of Christ. Kemper is one of the members of our Online Bible Study and provides a fresh look at many passages we cover. Our Heavenly Father has hidden him away for the last couple of decades and he has focused intently on understanding the breadth of the Word. I know for a certainty that when we cover his book in our Bible study, many of the brethren will be grateful for his willingness to write this book for distribution. I also know that I will read this book again as I want to immerse myself in the many truths that are contained therein. We expect to begin filling orders for the book by the end of next week. The Lord Jesus Christ is perceived by many to be a prominent religious figure whose influence on world events is debatable and whose teaching is subject to personal interpretation. 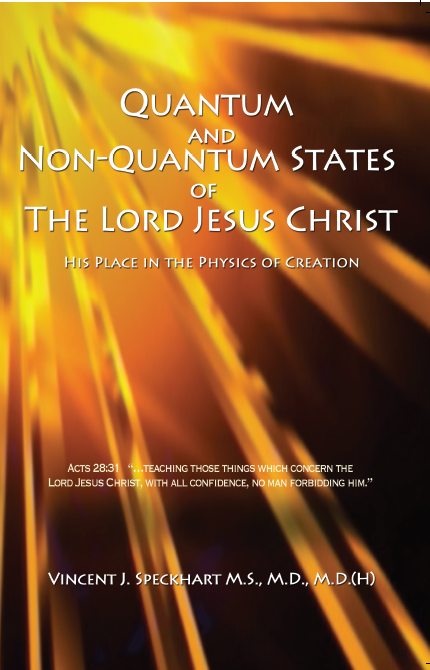 This book explains that structures and functions in creation are based on scientific laws of physics that are in agreement with revelations found in the narrative of Sacred Scripture. You will click on the . You can then purchase not only Dr. Speckhart’s book but our other books. We will send you the requested books at no charge and we will also pay postage. I want to thank you for sending the Ascending to Love book. I have read it and I have had dreams and visions which confirm to me what was written in the book. myself because I knew God would take care of me when I reached out to others. Also I could NOT be offended in anyway by anyone. There was no self in that love. There was no fear. If God wanted me to talk to thousands or even millions of people there wouldn’t be any fear because I knew God would give me the right words to say. (normally I couldn’t do that) This only lasted a short time. It was a beautiful place to be always. I do believe this is the revelation of love this book is about. Thank you Robert Henley for writing this book and giving it freely. Her vision depicts one of the fruit I expect to come forth as we embrace the fullness of Love.